I usually think of chowder as a cold-weather dish. 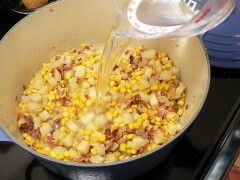 During summer when I can get fresh corn, I like it on those cool nights after it rains. I know it’s not really cold, but when it drops from 95° to 80° in a few hours, it sure does feel like soup weather. Usually my pictures match the description, but this time I’m going to have to ask you to use a little imagination. What I’m going to describe is actually easier than what you see here. Before you start cooking anything, peel the potatoes and strip the corn off the cob. (In case you didn’t notice, those were links to a tip for peeling potatoes, with Maryanne from Gilligan; and a tip for cutting corn off the cob.) 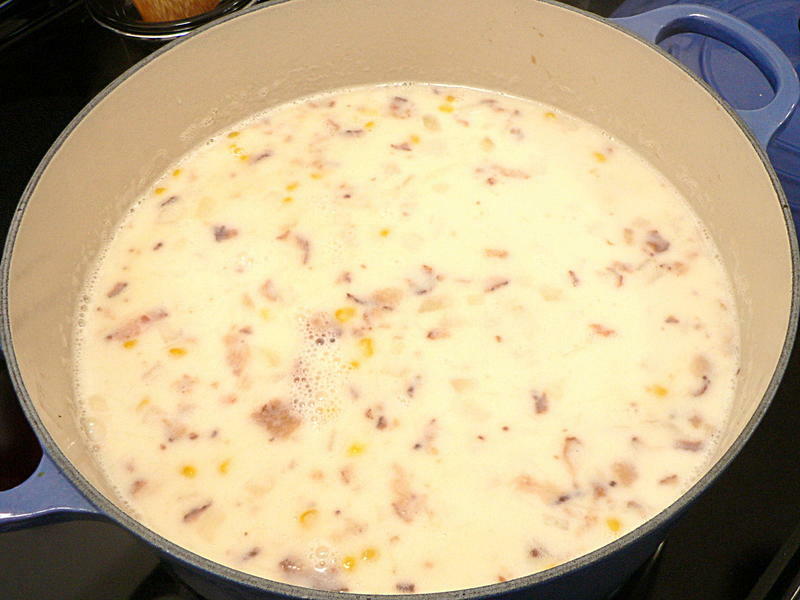 Or you can use frozen corn, like I did when I realized we had already eaten most of our fresh and I planned to make the chowder. 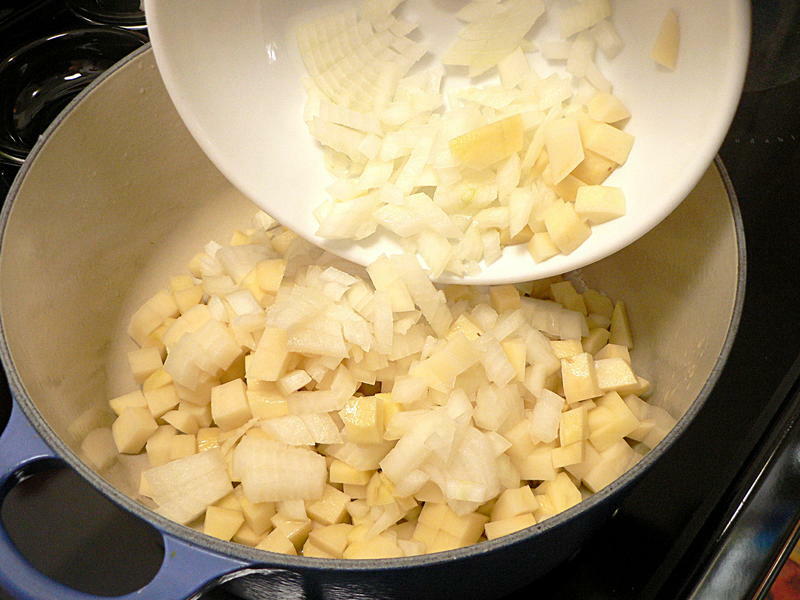 Once the potatoes are peeled, dice them and set aside with the onions, which you should also peel and dice. Here’s where I’m going to depart from the pictures. In the ingredients I show the bacon already diced and cooked. Note that I didn’t say “cooked and diced” – that’s on purpose. I always dice the bacon first. Makes it much easier to handle, and cooks more consistently, too. I also show a bowl of filtered bacon fat, saved from the last time I made bacon. If you already made bacon for another recipe (like I did) and you also keep your bacon fat (like I do) then you can use that. What I’m going to describe is for everyone else. 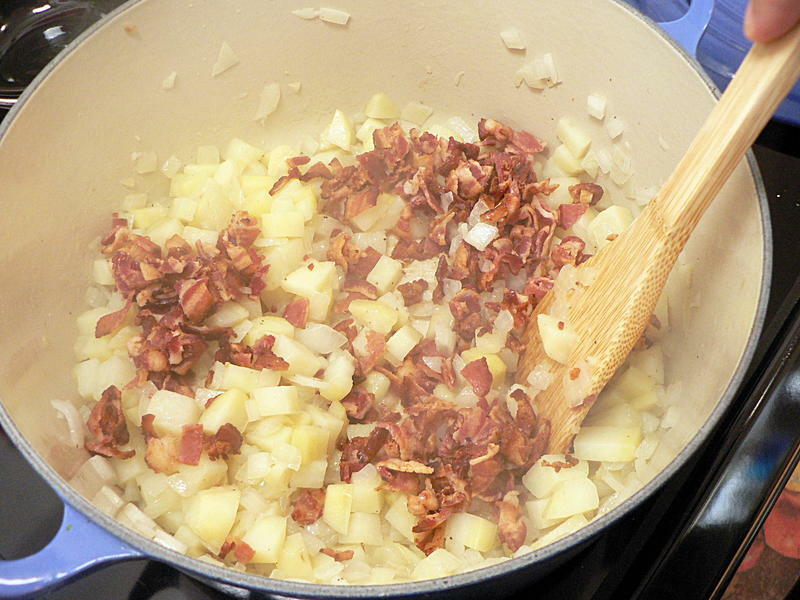 Imagine that right here you’re seeing a picture of diced bacon frying in a Dutch oven . Do you see it? Great. 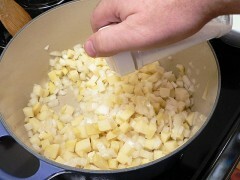 Now, without draining off the fat, toss in the diced potatoes and onions. Season with salt and pepper and cook until the potatoes are soft all the way through, tossing frequently to keep it from sticking. 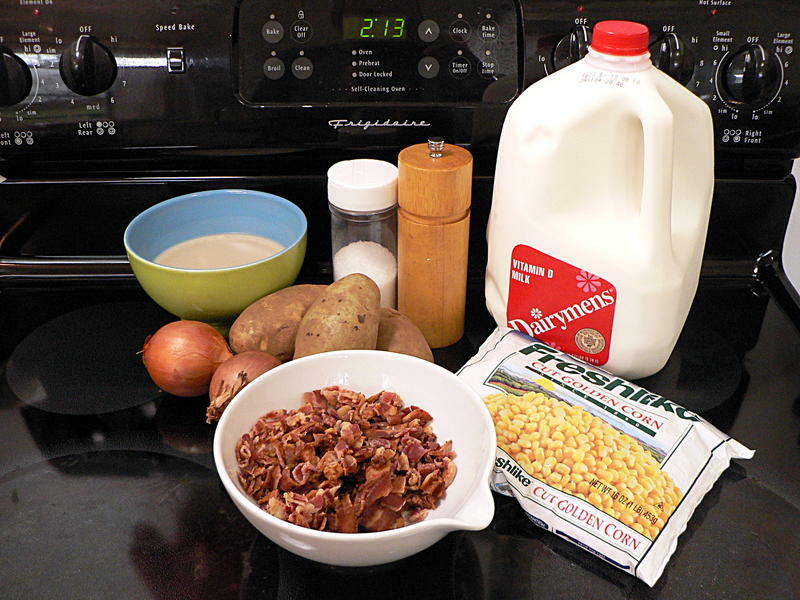 If you used pre-cooked bacon, add it now. 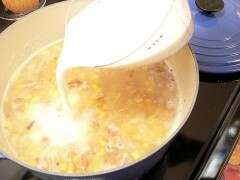 Add the corn and the water and simmer for 10-15 minutes. Add the milk and check the seasoning. Peel and dice the potatoes and onions. Dice the bacon and fry in a Dutch oven. Without draining the fat, add the diced potato and onion. Season with salt and pepper. 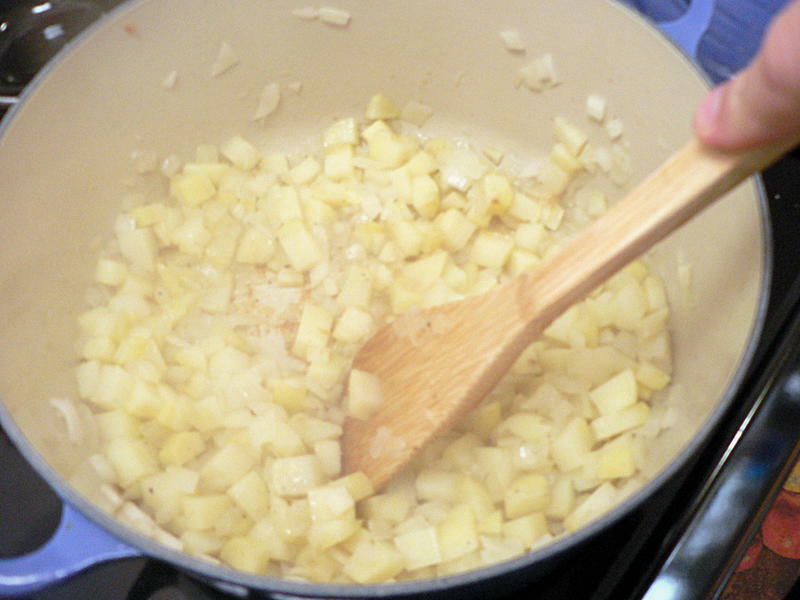 Cook over low heat until the potatoes are soft all the way through. Add the milk and adjust seasoning.